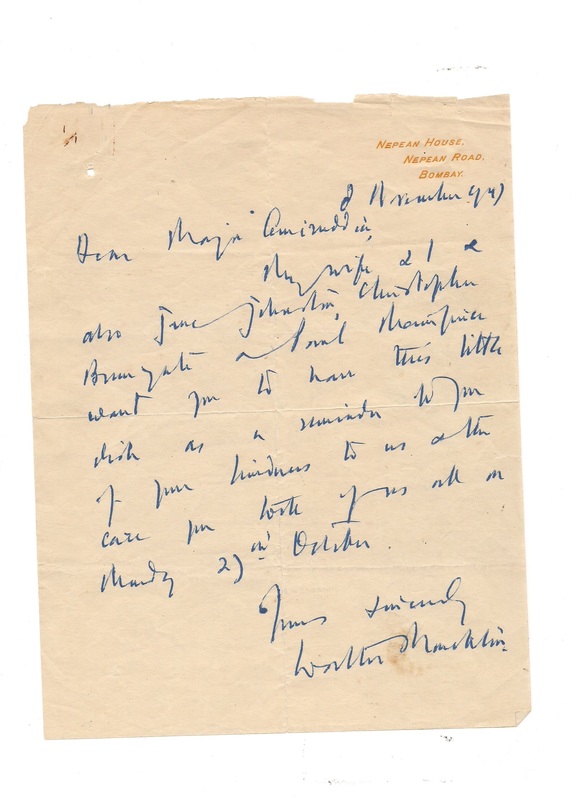 A hand written letter by Sir Walter Monckton, Q.C., Constitutional Adviser to H.E.H. 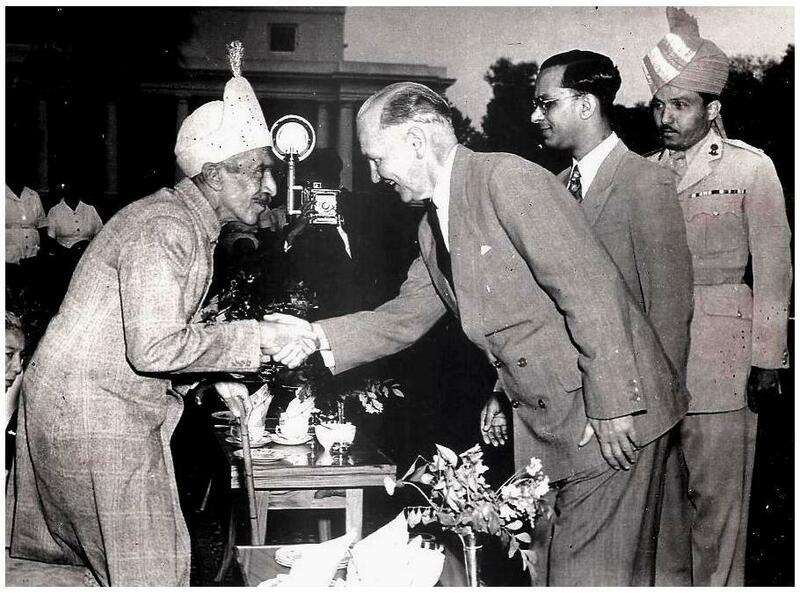 the Nizam of Hyderabad thanking (then) Major Amiruddin for personally saving his life during the Razakar agitation. A letter from the Headquarters of H.E.H. 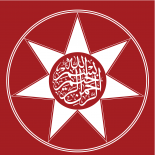 the Nizam’s R.F., from Major-General Syed Ahmed El Edroos the Commander-In-Chief of the Hyderabad State army. A list of the qualifications of Lord Nawab Lt. Colonel Amiruddin including his Honors and Awards. Lord Nawab Lt. Colonel Amiruddin was trained in Small Arms School, Artillery Troop Commanders Course, Chemical Warfare School, Artillery Regimental Survey, Air Transport Support, and was a Senior Officer of Tactical School. 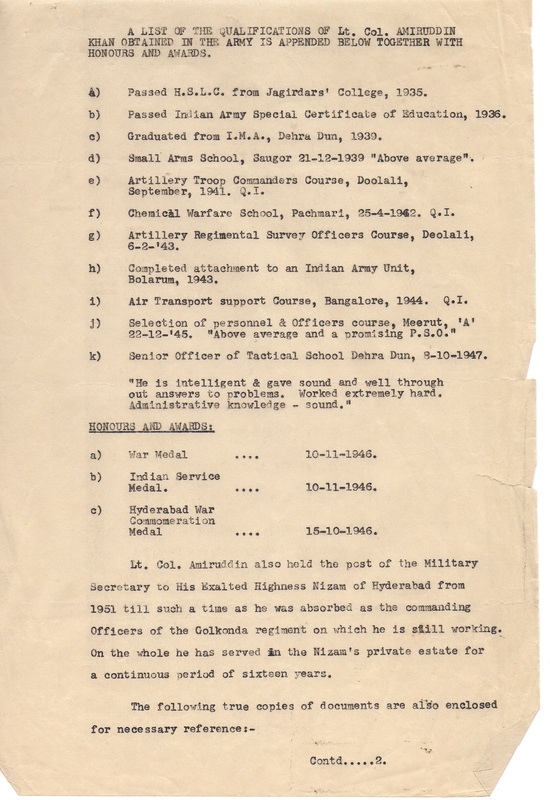 He was awarded a War Medal in 1946, Indian Service Medal, Hyderabad War Commemoration Medal. 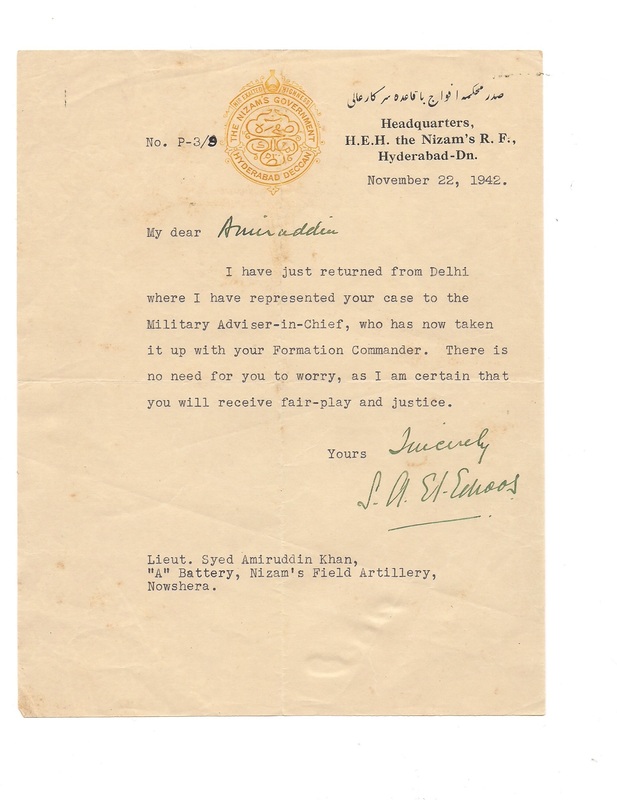 Lord Nawab Lt.Colonel Amiruddin held the post of the Military Secretary of His Exalted Highness the Nizam of Hyderabad from 1951 until he was absorbed as the commanding officers of the Golconda regiment. On the whole, he served in H.E.H. the Nizam’s private estate for a continuous period of sixteen years. (AP) Eleanor Roosevelt with H.E.H. Asaf Jah VII the Nizam of Hyderabad on March 16, 1952. 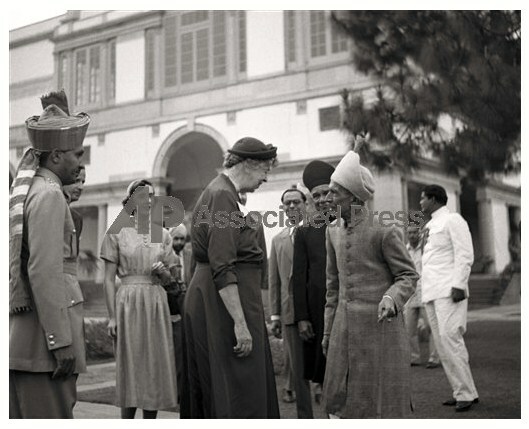 Behind Mrs. Roosevelt (far left in official head dress) is Lord Nawab Lt. Colonel Sayyid Mohammed Amiruddin, the Military Secretary of H.E.H. The Nizam of Hyderabad. This entry was posted on October 1, 2012 by ASFC in Ahmed Amiruddin and tagged Colonel Amiruddin death, Hyderabad, Nizam of Hyderabad.